Chuck Ranson, The Wealth Management Expert Witness, has 30 years of real-world experience in the financial services industry. 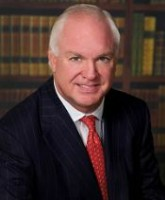 He provides expert witness services in litigation, arbitration, mediation, and pre-litigation case evaluation related to disputes between financial services firms and investors. Having worked with some of the wealthiest investors in the country has provided him with a unique perspective on the relationship between fiduciaries and investors. Charles W. Ranson is an expert witness based in Palm Beach, Florida who specializes in arbitration, mediation, pre-litigation case evaluation, and litigation support in the wealth management industry. When there is a dispute between investors and a financial service firm, Charles W. Ranson will provide an unbiased opinion based on 30 years of experience in wealth management and financial services. Over the past 30 years Charles W. Ranson has served as a Vice President for Bank of America, an Investment Advisor for Oppenheimer, Merrill Lynch and Legg Mason, Senior Vice President of Atlantic Trust Pell Rudman, as well as the Managing Director of the US Trust Company of Florida. With his real world experience dealing with the relationship between investors and financial institutions, Charles W. Ranson is ideally suited as an expert witness in the segment of wealth management. Among the areas Charles W. Ranson provides assistance with are private banking, asset management, investment suitability, due diligence, failure to supervise, lender liability, structured products, trusts & estates, securities fraud, unauthorized trading, alternative investments, hedge funds, commodities, private equity, and breach of fiduciary obligation or duty. If you require an expert witness with years of experience in the world of wealth management, Charles W. Ranson is a perfect fit for your needs. Bank Cross-selling; Trustee Duty of Impartiality; Trustee Fee Determination; Breach of Fiduciary Duty. Charles W. Ranson has 30 years of experience in the financial services industry from which he draws his financial expertise. In 1983, Ranson became a registered representative at Legg Mason in Washington, DC, where he worked exclusively with ultra high net worth investors, entrepreneurs and family offices. He held positions at Merrill Lynch and Oppenheimer between 1986 and 1990. Ranson entered the banking industry in 1990, working at the Trust Department of Citizens and Southern Trust Company— now Bank of America. He joined the Chase Manhattan Private Bank in 1991 in Palm Beach, where he rose quickly through the organization from VP for business development and marketing to Managing Director at Chase Manhattan Bank NA, ultimately becoming President and CEO of the Chase Manhattan Private Bank in Florida in 1998. In his role as President, Ranson was responsible for the banking, credit, trust and investment businesses and worked with OCC regulators in all aspects of the bank’s audits and compliance with regulators. He also sat on the management committee of the private bank’s US markets group. In 2001 Ranson became Managing Director of US Trust Company of Florida, and in 2002 he was recruited to open the Florida offices of Atlantic Trust Company. He formed Integritas Advisors, an independent investment advisory firm, in 2004. From 2006-2010, he was Founding Chair of Tiger 21, the nation’s leading peer-to-peer learning group for ultra high net worth investors. Ranson has real world experience in dealing with the complex relationships between investors and financial institutions. In his role as senior officer at all of the above firms, Ranson was involved with investment management, trust services, estate administration, credit and banking, derivatives, alternative investments, and risk management products. As the founder of an independent investment advisory firm, he has experience dealing with all the regulatory issues a Registered Investment Advisor faces with the SEC. The opportunity to work with some of the wealthiest investors in the country at Tiger 21 provided him with a unique perspective on the relationships between fiduciaries and investors. Videos Provided by Charles W. Ranson Consulting, Inc.